Hey, friends! Since I shared 2 recipes this week I wanted to squeeze in a workout post, too, so I posted 3 workout videos! I had created these videos a while ago back when I was experimenting with online training on Fitnet. I decided not to do the online training thing (at least not right now and now through a 3rd party site), and took the videos I created and added them to my YouTube channel so anyone can do these! Maybe down the line I will start working on doing online training again, but if I tried that again it would be on my own and not through a 3rd part site. These videos are follow-along, so you can click play and start your workout. 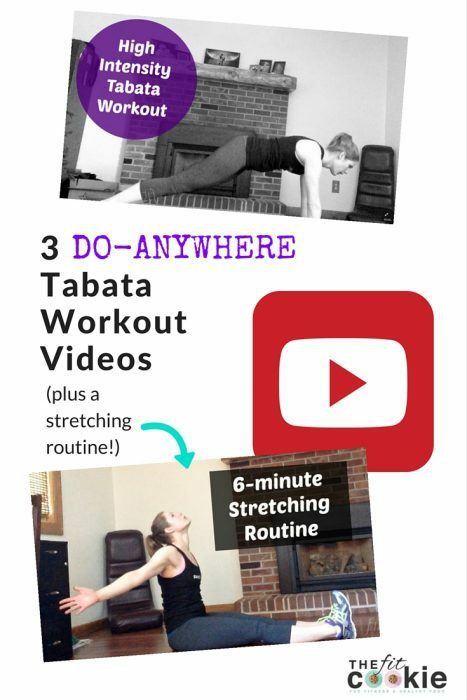 The beauty of these workout videos is that they are short (about 4-minutes) so you can add them into your regular workout routine, OR you can mix and match the videos. You can complete all of these workouts in succession from beginner to intense, or you can pick your favorite video and repeat it several times to get a good 15-20 minute workout. You pick! Here are the videos, in succession from easy, to moderate, to more difficult, then followed by my stretching video. If you like the videos, give them a thumbs up and let me know what you think! Don’t forget to do a proper warm-up before exercise, take time afterward to do a good cool down with the stretching video, and modify any moves that you cannot or should not be doing. If you’re up for a bit more challenge, then you can try this higher intensity and higher impact Tabata workout. If you want to good HIIT workout, repeat this video workout 4 times through with 1 minute of rest between each round and you will have a nice 20-minute workout! When all the work is done, do this 6-minute stretching routine to stretch the muscles you worked. You can also do this routine on rest days to keep you muscles and joints flexible on rest days.